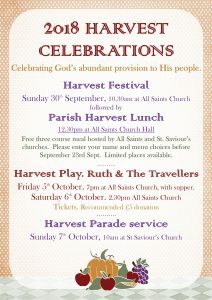 Whether it’s at one of our Harvest services or our Harvest play looking at the story of Ruth, we hope to see you soon at one of our Trentside Churches. Everyone welcome. Come ye thankful people, come! If you can come to our play, please drop the Parish office an email or leave a message so we can have an idea of number. Thank you!